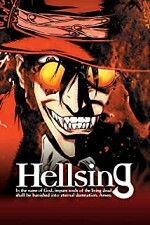 Watch Hellsing: Vampires and ghouls stalk modern-day England, hunting the oblivious populace. Only the Hellsing foundation stands between the evil undead and the innocent humans who would be their prey. But there's something new out there - chips that give humans vampiric ability and bloodlust are being sold as the latest designer drug. With a new wave of evil creatures rising, Hellsing must rely on its two most unlikely recruits - ancient master vampire Alucard and the newly turned Seras Victoria - but can even they stand in the face of such overwhelming odds?